Logic is not bound by any language boundaries. Similarly Mathematics also does not depend upon any language. It means that any logical or mathematical problem can be solved without any need to know any particular language. However there are many brainteasers in which one should require a particular language to solve these brainteasers. Word brainteasers are such riddles in which one need to know the English language. If one does not know the English then one can try solving Logical, Mathematical or Visual Brain Teasers and leave these brainteasers. However if one is good in English language then one is bound to enjoy these brainteasers. 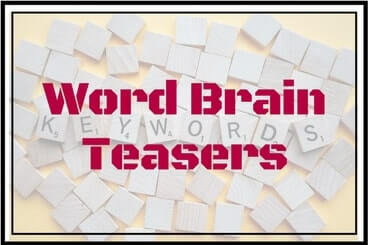 Here on this page I am posting the link to the Word Brain Teasers. Do click on the below links to open the corresponding riddle page. Rebus Puzzles Main Page: In these Rebus Puzzles your challenge is to find the hidden meanings of the given picture puzzle images.